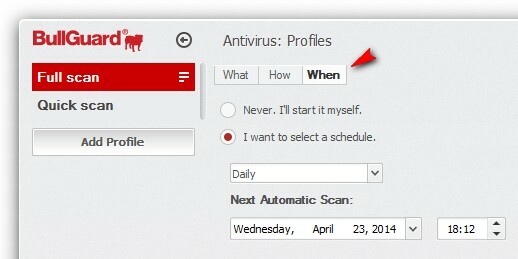 If you wish to schedule a scan, open the BullGuard application, click the button from the Antivirus box in the Main window then select Settings. Click on Advanced from the top-right of the window and then click on Manage Profiles, select the desired profile (or even create a new one as shown here), click on the When tab and click I want to select a schedule. Set the profile to run when it is most convenient for you . For MAC COMPUTERS & ANDROID DEVICES there is no need for scheduled scans as these devices work differently from a DESKTOP / LAPTOP PC.